Home Entertainment Azfar Rehman Hits Back at Haters Over Kiki Challenge Gone Wrong! Azfar Rehman Hits Back at Haters Over Kiki Challenge Gone Wrong! The latest trend of Kiki Challenge is taking the world of social media by storm. In the challenge, one has to jump out of a moving car and dance alongside it to Drake’s hit ‘In My Feelings’, as the vehicle keeps moving. Some serious accidents have also been witnessed and few countries have already banned this latest craze. Some international celebrities like Will Smith, Ciara, and Shaggy have also taken the challenge and people are going all gaga over them. The trend has caught up with the celebs in Pakistan as well. 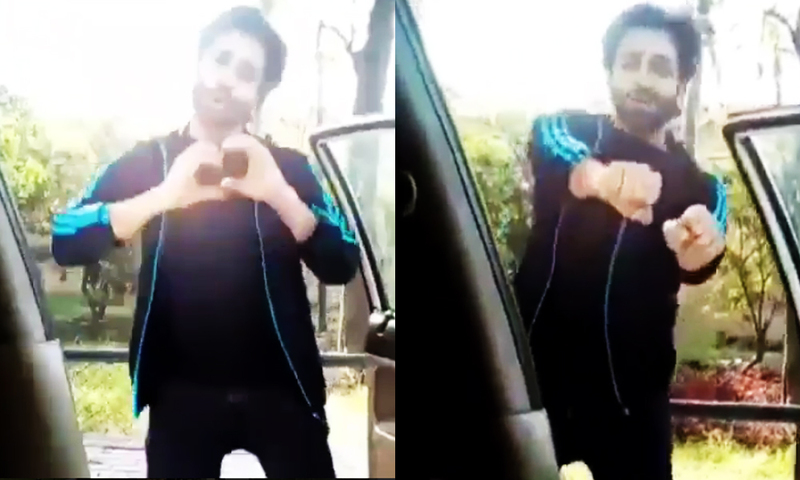 Recently, the Nazr-e-Bad actor Azfar Rehman has also joined in and posted his own video of leaping out of his moving vehicle and dancing. Bring it on! Now I challenge the maha Funkaar @aclockworkobi to complete the #MeriFunkaari challenge! #NesfrutaFunkaar @nestlenesfrutafunkaar …. There were many people who absolutely fell in love with his adorable dance steps including the Load Wedding actress Mehwish Hayat. But as usual, our celebrities always face online trolls no matter what they do. Look at what people have to say about the video! But since our celebs never feel embarrassed with such ridiculous and pointless comments, Azfar hit back to the troller in the sassiest way ever. Azfer humbly replied to all the hater and admitted he was pretty bad at it! In yet another post, he urged everybody to stay positive and not pay heed to those who bring you down! Well, it was good to know that he did not pay any heed to haters and did what he loves to do. Have you joined the Kiki challenge? Let us know in the comments section below. Previous articleSuzuki Pakistan Raises Prices for the Fourth Time in 2018!